Home » New Pokies » Witness the epic medieval battles in Warlords: Crystals of Power! NetEnt has announced the release of Warlords: Crystals of Power on the market which is their latest video pokie game project. We were eager to see what the game was all about and we can say we are not disappointed. As always the visual side of the game is simply perfect. We can see the recognizable top level animations from NetEnt, along with an exciting background music. The game has a great intro movie which sets you into battle mode as you wait for the game to start. The symbols are also interesting, with the Samurai, Barbarian and the Priestess being the 3 main symbols of the game. They can come covering the entire reel and the Samurai has the highest payout of 300 coins, equal to the Wild symbol payout. There are 5 reels and 3 rows in total where players can place bets from $0.15 to $150 per spin. The game play is very exciting with 3 different random wild features and 3 different free spins modes. All NetEnt video pokie games are visually attractive but the most interesting part about them is the bonus features. We love that Warlords: Crystals of Power has 3 different random wild features. They are designed around the 3 warlords of the game, where the Barbarian awards 4 wilds in the shape on a square anywhere on reels 1-4, while the Samurai and the Priestess will award 2-5 random wilds anywhere on reels 1-4 and 1-5. 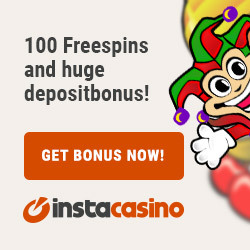 We also love the fact that you will get a re-spin and a final chance to trigger the free spins bonus if you are missing a scatter on the reels. Even if you don’t trigger the free spins you can still win up to 100 x bet prize in the final chance feature. The free spins are all very exciting. 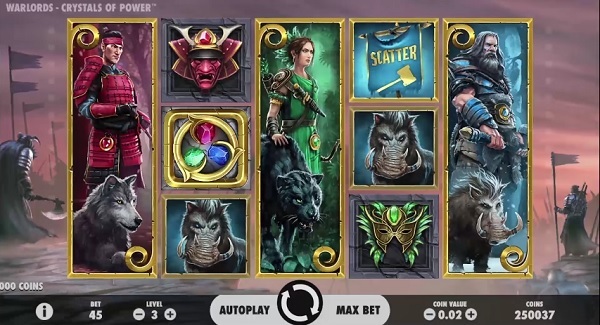 The Barbarian starts off with at least 9 free spins and only high paying symbols on the reels, where each additional scatter awards 3 extra free spins. The Priestess is also attractive with her 7 free spins and increasing multiplier, while the Samurai offers 5 free spins and sticky wilds on the reels. Warlords: Crystals of Power is a perfect video pokie game in many ways, but we can’t say that we are happy with the game pay table. The Samurai and the Wild symbols have the highest payouts, but it’s still only 300 coins for 5 of a kind combinations. In other words it’s only 10 x total bet which in our opinion is too small for a game like this. Despite the weak pay table we can still recommend Warlords: Crystals of Power as a good video pokie game. There are a lot of features which will make the game play exciting and it can still produce big payouts. Our favorite features are the Samurai and the Priestess free spins because of the sticky wilds and the increasing multiplier. With some luck they can provide some big payouts ranging in over 1,000 x bet.